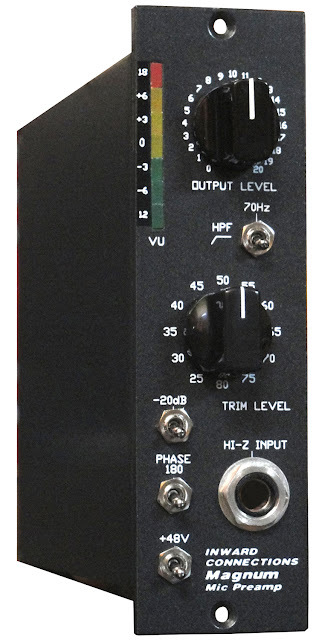 The Inward Connections Magnum VU Mic Pre is the same as the original Magnum Mic Pre except for the addition of a VU meter and the omission of the the 100 and 200hz HPF. So you get the same great tone, warmth and tons of gain. The Magnum sounds great on many sounds including those with high transients such as drums and also vocals. "With a warm and upfront low-end, punchy mid-range and open top end, the Inward Connections Magnum VU Mic Pre will bring new life to your recording rig. Classic sounding warmth, but with airiness and headroom for days. Magnum offers something different than the old standbys. Extra large tone for your lunchbox!"